The outside of Behind the Post Office. 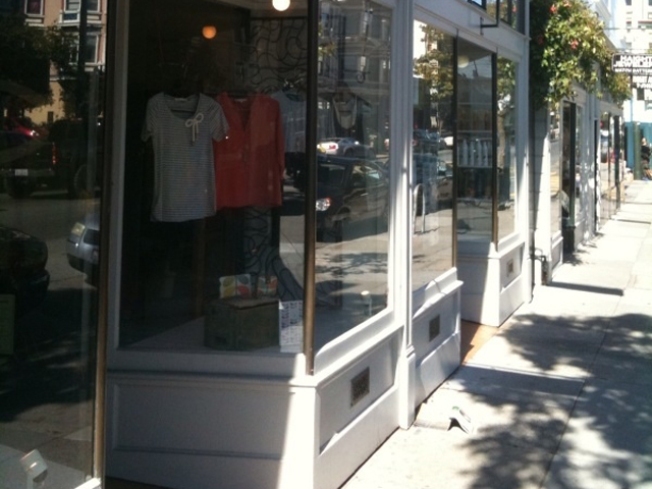 A variety of fashion boutiques line up, side-by-side on several blocks of upper Haight Street in San Francisco. One of the most popular low-key retailers on this strip is Behind the Post Office. Is it really behind the post office? Well, not exactly but the neighborhood p.o. isn’t far from it. However, the proximity has nothing to do with the name. It originally opened in San Diego and that’s when it truly was located behind the post office. The San Francisco store is the perfect stop for those of us suffering from department storephobia. It’s cozy, comfortable and a welcoming refuge from the hectic streets of the City. Soft fir floors, no-nonsense wood fixtures and natural light contribute to the ambiance of this well established shop. The collection of casual and contemporary career clothes are sensible and yet focused on keeping up with the trends. There is a handful of budding designers represented as well as several well known brands. Citizens of Humanity and J Brand labels are high up on the Richter Scale. Both lines are aka “the flattering jeans”. It’s just a matter of body type and shape. Citizens of Humanity is an international jean manufacturer headquartered in Southern California. The contemporary styling and designed-to-fit silhouettes makes it a first choice for savvy shoppers. J Brand, also a Los Angeles-based company, is the jeans of choice by most super-star music divas and have also been spotted on Sandra Bullock, Kate Hudson and Cameron Diaz, just to name-drop a few. A long list of Behind the Post Office clientele have been customers for so long that they’ve married, or not, and now have children. To accommodate the busy schedule s of the “loyals”, BPO offers a fun selection of fashion for kids. Tea Collection - for little citizens of the world, creates adorable items for our young shoppers in training. Lexie Quiring host personal shopping trips through the City. Visit ShopSFwithLexie for more information.